This article represents the beginning of the end of the United States. Many who will read this article will find themselves in agreement, at least initially, because the developments which serve to threaten the future existence of the United States because the events are well-documented. However, many will reach a saturation point and will close their computer screen and write an angry response and accuse the author of “fearmongering”. I would rather be labeled a fearmonger than be correct about the developments contained in this article. Americans need to deal realistically with the real reasons why America is about to be run over, both economically and militarily by Putin and his new found friends across the globe. I cannot shake the feeling that this is America’s epitaph and no amount of my own personal cognitive dissonance will convince me otherwise. The haughtiness of the West as they impose sanctions on Russia over Ukraine is almost laughable. The sanctions are a boomerang in disguise and will come back at us to destroy the American economy which will lead to World War III. At the heart of the American economy and the Petrodollar is energy and Russia and China just cemented an agreement where they do not need the dollar. 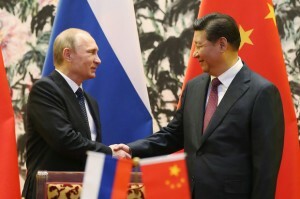 The Russia –China $400 billion energy deal, signed in May this year will by 2018 have some 38 billion cubic meters of gas flow through the so-called ‘Holy Grail’ pipeline from the largest gas producer, Russia, to the largest energy user, China. This deal is many things at once: It is, of course a symbolic step in the process of decoupling hydrocarbon trading from the dollar, as it foresees payments in local currencies, rubles and yuan. It sidesteps the Petrodollar for hydrocarbon trading. 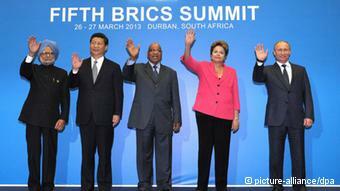 Over one-third of the planet just moved away from the dollar when this recent deal was cemented. As if the Russian-Chinese energy deal is not bad enough, the BRICS are driving a stake into the American economy as they have set up a new development and investment bank for all of the BRICS countries. The banks will be headquartered in Shanghai, China, with the first president of the bank will be from India. The BRICS nations, of course, are a group of emerging economies and draws its name from the five member countries – Brazil, Russia, India, China and South Africa. BRICS is also considering starting a joint infrastructure fund with an initial capital infusion of around $100 billion to begin investing in each other’s transportation, water and sewage systems. Turkey’s gas deal, just inked with Russia, represents one more time that the grand chess master, Putin, has outmaneuvered the amateur checkers player, Obama. With this gas deal, Turkey may not have formally left NATO, but make no mistake about it, Turkey has left NATO. Turkey and Russia are long-time adversaries since the implementation of the Cold War and the advent of the 1947 Truman Doctrine. This gas deal is a staggering blow to the U.S. and NATO because Turkey has been not only a key NATO ally, but it has been the linchpin of all American efforts to bypass Russia with oil and gas pipelines. The situation caused by the Turkey-Russia gas deal is so dire, that in the event of World War III, the U.S. would be forced to destroy this pipeline. In other words, Turkey has just become a military ally with Russia. Russia’s decision to cancel Russia’s South Stream gas and oil pipeline project was bad enough, but this coupled with Turkey’s signing a gas and oil deal with Russia delivered a staggering and perhaps knockout blow to the ability of the United States to hold together a rapidly fragmenting NATO. South Stream was envisioned as a way to supply Central and Western Europe with Russian gas without worrying about disruptions caused by the Ukrainian situation. 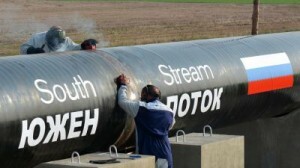 South Stream was supposed to run through the Black Sea, Bulgaria, Serbia and Hungary into Austria and points west and it attempted to counter South Stream by proposing another pipeline, called “Nabucco” which was to have linked Austria, Hungary, Romania and Bulgaria with Turkey and Azerbaijan. This pipeline failed because the United States failed to secure funding for the pipeline and or a source of gas. Are you keeping a body count of the NATO allies which are going to have extreme difficulty heating their homes and businesses and are now subject to Putin’s blackmail? From a military perspective, these nations provide a buffer between Russian invasion of America’s primary NATO allies of Germany, France, Italy and the UK. Putin will now focus on seeking defectors from these four allies. The eventual defection of Germany, France and Italy is easy to foretell. This is a case of a picture, or in this case, an energy map, is worth a thousand words. To anyone possessing an IQ above room temperature, this map is the road map to the destruction of NATO. Key NATO allies are being held hostage by Putin through energy blackmail. If NATO was to survive, the time to have attacked Russia was last Spring, but that ship has sailed. Can you imagine, you just opened your contacts list on your phone and all of friends and business associates are gone. This is what is happening to the United States. America is on the verge of losing its closest and most important ally, Great Britain. Even General James Cartwright, Former Vice-Chairman of the US Joint Chiefs of Staff, signed the following letter. “Tensions between nuclear-armed states and alliances in the Euro-Atlantic area and in both South and East Asia remain ripe with the potential for military miscalculation and escalation,” says the letter to Sebastian Kurz, Austria’s Minister for Foreign Affairs. “In a vestige of the Cold War, too many nuclear weapons in the world remain ready to launch on short notice, greatly increasing the chances of an accident. “There should also be better crisis management in “conflict hotspots” and new security measures, warning that stockpiles were “insufficiently secure, making them possible targets for terrorism”. The above is a chicken-little, Neville Chamberlain type of proclamation which is telling the United States that we will not be supported as world events move toward World War III. America will soon be alone. 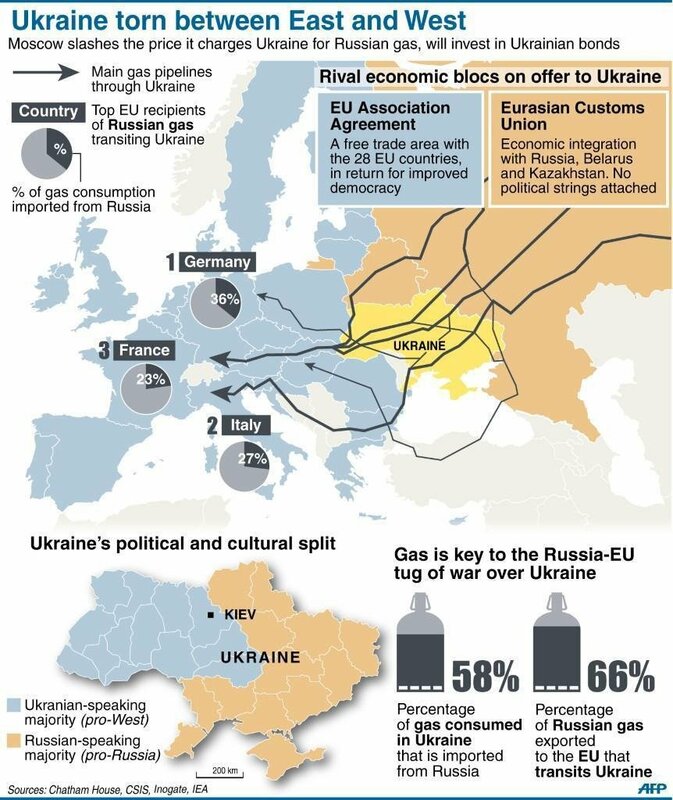 The developments in Russian gas deals has given rise to resurrection of a major portion of the old Soviet Union. Just like the mythical Phoenix, the old Soviet Union is attempting to rise out of the ashes. The EAU is a proposed economic union of Belarus, Kazakhstan and Russia. On November 18, 2011, the leaders of Belaurus, Kazakhstan and Russia signed an agreement, setting a target of establishing the Eurasian Union by 2015. Kyrgyzstan and Tajikistan have expressed interest in joining as well as has Belarus’ neighbor to the immediate south, Ukraine. Isn’t it interesting that Georgia’s Prime Minister, Bidzina Ivanishvili, stated in September of 2013 that they were also examining the advantages of acceding to the EAU. Also in September of 2013, Armenia has announced its intention to join the EAU. This union cannot be allowed to happen by the West because it will tip the balance of power in the world. Not only has Putin undermined NATO and is strategically leaving America alone to fend for itself, he is quickly putting together a quick strike team from which to militarily invade the United States. 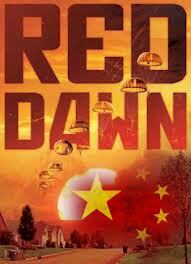 As this crisis moves forward, it is amazing how accurate the Red Dawn movie of the 1980’s was almost 30 years ago. Amazingly, Obama has not done one thing to counter the following Latin American Russian military alliance being constructed to invade the United States. 1. According to a March 2014 report by the Strategic Culture Foundation, a progressive, pro-Russian think tank, Nicaragua’s quoted former Sandista leader, Daniel Ortega, who reinstalled himself in 2007 as the Nicaraguan leader stated that “We are very grateful and very much appreciate the Russian people’s support of our country.” Ortega has accepted the arrival of two Russian strategic bombers and added that more will be on the way as Russia announced that Nicaragua has announced that it will accept routine Russian patrols in both its Caribbean and Pacific ports as well as participating in the joint training of military personnel. 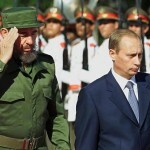 Russia and Nicaragua have moved in the direction of a strategic economic and military relationship. 2. Argentinean President, Cristina Fernández is determined to develop close economic relations with Russia as the left-wing liberal Argentinean leader has invited Russia to invest in fuel projects in an obvious attack upon the Petrodollar. 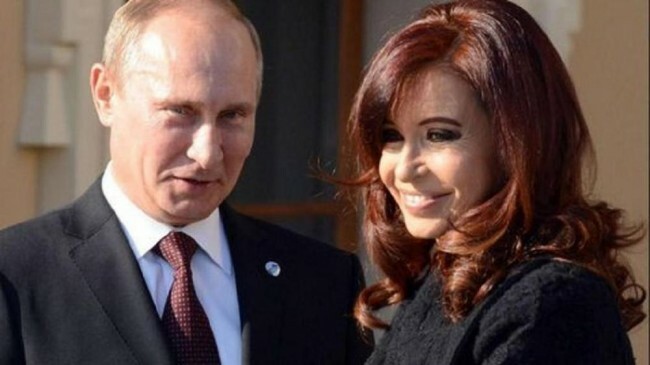 Fernandez also cut a deal with Putin which supports Russia’s grab of Crimea in exchange for Russia’s support of Argentina’s quest to annex the Falkland Islands. 3-5. 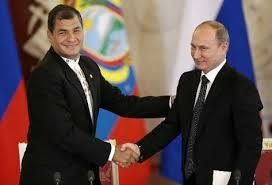 Ecuador’s President Rafael Correa praised Russia as a “great nation”, while visiting Moscow in October of 2013. 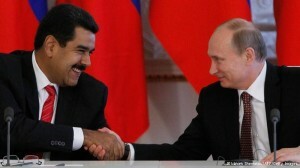 Putin was indeed praise-worthy because he promised to invest $1.5 billion into new domestic energy projects in Ecuador. Correa also stated that his country was planning on buying Russian military equipment. Russia has signed several billion dollars of contracts with Venezuela and supplies Bolivia, among other countries from the region with military weapons. The military package includes attack aircraft and helicopters. 6. Brazilian Defense Minister Celso Amorim, stated that “More than buying military equipment, what we are seeking with Russia is a strategic partnership based on the joint development of technology.” Amorim’s statement is consistent with the fact that Brazil, South America’s most populous nation, has announced that it is planning to purchase short-to-medium-range surface-to-air Pantsir S1 missile batteries and Igla-S shoulder-held missiles from Russia. Previously, Brazil has purchased 12 Mi-35 attack helicopters. Russia and Brazil have also signed an agreement for Brazil to acquire 36 attack aircraft. Amorim said Russia and Brazil would also look at working together on space technology and on defense against cyber attacks, an area that has become a Brazilian priority since disclosures that the NSA has spied on Brazilians, their president and the country’s largest oil company. Russia is marrying their military with Brazil and Brazil could become Russia’s space partner in “killing” America satellites. 7. Newly elected El Salvadorian President, Sanchez Ceren, has signed an agreement with Putin entitled “Federal Law On Ratification of the Agreement on the Foundations of Relations” which pledges economic and military cooperation. Ceren, is a self-declared Marxist-Leninist and is considered to be very-anti American. Leaders from the Community of Latin American and Caribbean States (CELAC) and Russia declared their intention to establish a means of continuous dialogue “to discuss and synchronize positions on international issues.” CELAC includes thirty-three countries in the Americas, but the United States and Canada are excluded. This is the breeding ground of a “Red Dawn Scenario”. 8. 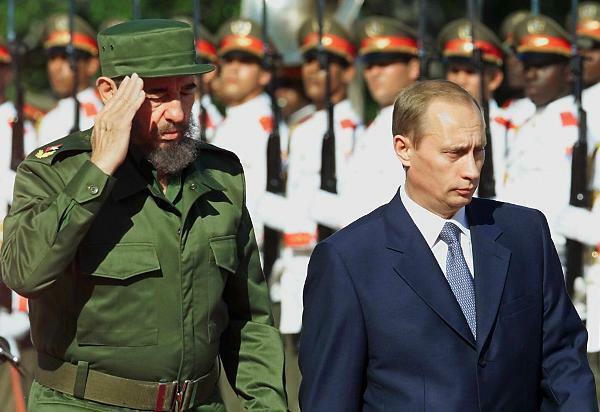 Pravda quotes Putin as stating that Russia had obtained the consent of the Cuban leadership to place “the latest mobile strategic nuclear missiles on the Island…” Recently, the Russians surprisingly docked a Russian spy ship in Havana. This is the Cuban Missile Crisis revisited! The year 2015 looms large as this is the target date for Putin to complete the construction of the EAU and form an alliance with the other BRIC nations. This means that a war will likely take place prior to the end of 2015 or in early 2016. This war will undoubtedly be nuclear with the losing side resorting to the nuclear option. To my fellow Americans, it is easy to fall in love with Putin and declare him a hero because he is opposing the IMF and the World Bank. However, if Putin has his way, he will become America’s worst nightmare. Putin is under the control of the banksters at the highest level. The Bankers from Basel want World War III. Putin and Obama are merely pawns in the same scheme. What most of us do not realize is that there is the central banking cartel and then there are the people who really run finance on this planet. The central banks, such as the Federal Reserve, are merely mid-level managers which were created to serve a purpose. The coming conflict is about the preservation of central banking as an international element of control. The real power on this planet are above central banking and are pushing the world towards an eventual war of unification. A subsequent World War III will wipe out all competing economies and out of chaos will come order, the New World Order. We are about to witness an old-fashioned cockfight while the real power brokers are sitting back and waiting for nature to take its course. Why hasn’t Obama moved to counter Putin’s moves with regard to the energy encirclement of the United States? If Obama were truly representing the people, he would have done so multiple times. Instead, he spends his time on the golf course while Russia encircles America both economically and militarily. If America was truly to be outmaneuvered by Putin from an energy standpoint and the ruination of the Petrodollar and the American economy were at hand, the time to have launched a war against Putin would have been before NATO began to fragment. I can draw no other conclusion than this President is part of the plot and he is fulfilling his Manchurian Candidate mission of undermining America’s chance to prevail in World War III. There is a good chance that America may be forced to capitulate without firing a shot and the “dreams of Obama’s REAL father will be realized”.